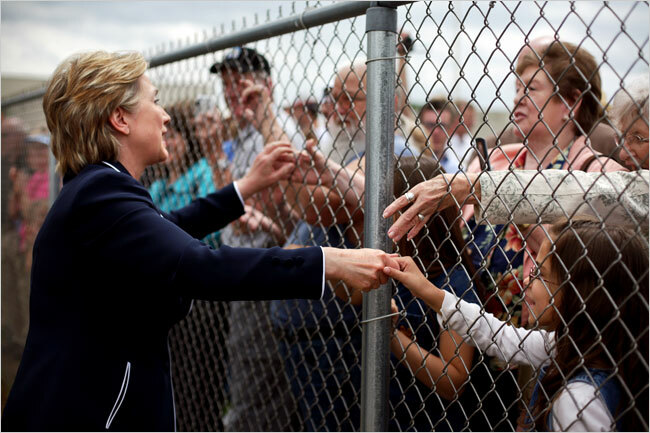 Senator Hillary Rodham Clinton greeted supporters at the Bowling Green airport on Sunday after a rally on the campus of Western Kentucky University. 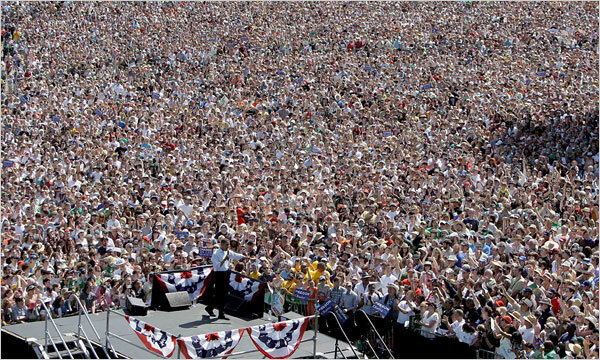 Barack Obama spoke to 75,000 people on Sunday in Portland, Ore. He called it “the most spectacular setting for the most spectacular crowd” of the campaign. It’s clear that the NYT article is reporting on a perceived momentum in the popularity contest side of things in this campaign – but the choice of images to associate with the story seems, well – in my opinion – ludicrous. Consider vantage point, background and the detail. If you were a candidate – which image would you feel good about? Two or three interested faces and hands straining to reach through a chain-link fence (what an interesting foreground – very metaphorical) with another half-dozen (I assume there might have been more there?) rally attendees seemingly staring off into space or something just about as interesting in the background – that photograph appears to pretty much say all there there is to say about popular vote one might presume. But of course to be fair, it is too much to expect one article and two pictures to be a good , fair and researched indication of what might actually be going on “out there”. So what do you think: Is this persuasive photojournalism coupled with a creative photo editorial statement or just plain silliness ? This entry was posted in Culture, Documentary, Other Artists, Photography and tagged Clinton, journalism, Obama, perception, Photography, silly, vantage point by Matt Niebuhr - West Branch Studio. Bookmark the permalink.